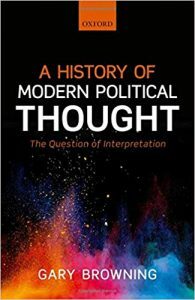 Predictably, Gary Browning’s History of Modern Political Thought: The Question of Interpretation approaches the history of modern political thought through the question of its interpretation. Part I summarizes seven interpretive ‘schemes’: dialectical (Hegel and Marx), historical (Oakeshott, Collingwood), contextualist (Quentin Skinner and the Cambridge School), deconstructivist (Derrida), Foucauldian, and hermeneutical (Gadamer). Part II puts these various schemes in conversation vis a vis a canonical thinker, the thought being that one can get more out of Hobbes by reading him according to these various schemes. In general, the book is both a transposition of literary theoretical debates into the study of the history of political thought and an introduction to these interpretive schemes that gives examples of their use. With its broad introduction to a number of interpretive standpoints and its straddling of academic disciplines its strength is its scope. The text is however not merely introductory but offers its own “synoptic” standpoint produced out of the interpretive conflict Browning stages between schemes. The review that follows will deal primarily with the philosophical grounding of this standpoint; namely, (1) a philosophical conception of time as the blank and homogeneous time of historicism and (2) the legitimacy of adopting a hermeneutical standpoint—modelled on a conception of intersubjective interpretive conflict resolved through dialogue—towards the relation between political theory, the interpretation of political theoretical texts, and history. Browning repeatedly emphasizes interpretive diversity, inclusivity, and pluralism. Every scheme has strengths and weaknesses and the issue is tallying up the good bits and subtracting the bad. Whether an interpretive scheme focuses on text or context; the construction or deconstruction of authorial intention, all have something to add to an unending process of interpretation. Browning’s self-understanding of his own theoretical standpoint is as a kind of dialectical hermeneutics. Via Hegel and Marx, Browning takes thinking ‘dialectically’ to be the “seeing everything together” constituting synopsis in the Greek sense—i.e., σύνοψις (súnopsis), from σύν (sún, “with or whole”) + ὄψις (ópsis, “view”)—meaning whole view. ‘What stands out amidst all readings of Hegel’, he writes, ‘is a respect for his capacity to engage critically with diverse theoretical positions and partial readings of the social world in presenting a synoptic perspective’ (273). In general, he seeks to revisit the ‘interpretive holism of Hegel and Marx while abandoning their self-styled certainties, particularly over the imagined teleological end of history’ (5). Some Hegelians will take issue with Browning’s reading. Hegel’s theory of history is “controversial” for following a ‘necessary pathway to the realization of freedom’, while the experience of racism, genocide and environmental catastrophe ‘reinforces caution over the notion of a benign end of history’ (35). There is a question regarding which concept of freedom is operative. Here at least, Browning appears to mistake a critique of Hegel for a critique of Fukuyama. One can’t help wonder what Browning makes of Hegel’s description that ‘the sole work and deed of universal freedom is … death’ (Hegel, 538). Vis a vis the hermeneutical side of things, Browning addresses a set of problems internal to the ‘linguistic turn’–the lack of direct or unmediated access to a text qua text, as there is no outside. Unsurprisingly, Browning takes aim at textualist approaches. For Browning, the schemes in Part 1 take into account mediations ignored by an unreflective textualism claiming immediate access to its object. Recall that the “hermeneutic circle” is the idea that textual meaning is grasped through the interplay of parts at the same time that the parts must be grasped from the perspective of the whole. Browning’s fundamental theoretical move is to apply this not to a text itself but to the history of interpretive schemes of other texts. He does well to register the necessity of thinking philosophy and history together, beginning with a critique of Klosko’s separation of the two in The Oxford Handbook of the History of Political Philosophy (1). Browning’s point however is merely methodological—the ideal historian of political thought combines the empirical material of history with the conceptual subtlety of the philosopher. The text does not take as a starting point an analysis of history as itself a philosophical problem and philosophy as itself historical. Indeed, in terms of its conceptual complexity, history is doubled in way that remains merely implicit. There is of course (1) history—and the question of teleology—inextricable from the political and from which, following Browning’s broadly historicist standpoint, there is no outside, but there is also (2) the history of interpretations of political thought. One way of posing the Marxist critique of political theory, and in particular the social-contract tradition over-determining what retrospectively appears as the history of political theory, is that the ‘state of nature’ erases the social/historical determinations of what appears as the ‘consent of the governed,’ thus reinforcing the necessity of the present. As the historical generation of concepts and social constitution of value is forgotten, the social totality appears as if it were determined according to natural laws as relations between things. Given Browning’s concern for temporality, it is surprising that Browning does not interrogate the temporality internal to the modern political theoretical tradition itself. This tradition is based on an Enlightenment theory of universal historical development, and sees history as uneven but progressive, and the function of politics as regulating society, as it were, into the evenness of a certain conception of the present. Indeed, the homogeneous time of historicism that Browning appears to take for granted might be said to serve a synonymous regulatory function for the philosophy of history that the state of nature does for political theory. Enforcing the necessity of the present demands the construction of the past, and historicism locates the past in a transhistorical projection of a homogeneous and blank conception of time as a linear dynamic. While it might be true that the unity of both Marxian and Hegelian theories of history comes at the price of eliding historical contingency (387), a Marxist position that attempts to avoid the antinomy of necessity and contingency is not considered. A representative of such a position would be Moishe Postone, who grasps the imminent necessary directional dynamic of history as an actually existing (so not merely subjective) historically specific characteristic of capitalist modernity that can be projected onto all human histories, but is not a universal characteristic of human social life in general. Indeed, for Postone, historicism is the retrospective projection of a specific temporality of linear development internal to capitalism to history in general. In his Politics of Time, Peter Osborne describes historicism as, ‘a functional replacement within the amnestic temporality of modernity for the continuity of historical time previously established by tradition’, which, ‘regulates interruption as series by the generalized projection of the abstract temporality of the new onto history as a whole’ (Osborne, 139). Heidegger, Benjamin, and Althusser alike see historicism as the imposition of empty homogenous time understood as a linear succession of the new onto collective forms of subjective time. All three might accuse Browning of the same imposition of singularity onto multiplicity that he sees as so problematic within the realm of teleological theories of history. In terms of (2), the history of political thought, the encounter between the Gadamerian construction of the terms of understanding, and the Derridean deconstruction of intention, serve as a model for the conflict Browning stages between interpretive schemes. Yet, there is little exploration over whether this intersubjective model is theoretically appropriate for the interpretation of political theory, much less the interaction between political theoretical texts, history, and the history of their interpretation. If political theory deals with sociality, is it not precisely the reduction of sociality to relations between individuals that, from a Hegelian standpoint, is the Kantian epistemological reduction of the social? Is this not the very logic behind the transition from the intersubjective master-slave relation to the ‘Spirit’ section of Hegel’s Phenomenology? The question here is over one’s understanding of social form. For Marx at least, form is not derived from an act of cognition that abstracts from experience. There is an objective moment constitutive of the unity of society that is not merely a product of subjectivity. “Society” is not merely produced according to an additive process of the intentional action of human beings according to a certain worldview. Concluding his text, Browning claims, ‘the encounter demonstrates a conflict between construction and deconstruction as forms of interpretive operation’ (376). Construction (positive) and deconstruction (negative) is the binary through which Browning seems to view all interpretive gestures. An issue here is the portrayal of Derridean deconstruction as a negative operation. As Robert Bernasconi points out, this is actually Gadamer’s own understanding of Derrida more then Derrida’s understanding of himself (Bernasconi, 238). Far from it being the case that Derrida insists on a critique of the author that has the language of intention as its target, the very notion of the author serves the strategic function of providing unity where there is none. Browning reduces the Derridean position to an interpretation of that which lies outside the author’s intentions. One is always already inside and outside of a text, not simply by the (1) history that determines the text itself, but also (2) the history of powerful interpretations of that text. Indeed, Browning’s own standpoint is not outside either. He too is the author of a text and subject to the mediations always already present in interpretation. Tallying up the advantages and disadvantages of various interpretive standpoints leaves Browning located at an Archimedean standpoint outside the logic of the social/historical determination of interpretation. This is not, in a rather facile and predictable way, to turn Browning’s logic against him. Browning is surely aware of these issues, but the point is rather to interrogate Browning’s own self-understanding of what makes his position dialectical. Whereas Hegel in the Phenomenology attempts to self-consciously appropriate and summarize the history of philosophical positions so that they are reflectively and critically internal to his own, Browning’s methodological operation is merely additive—he just adds what he takes to be various interpretive positions together to construct a standpoint sub specie aeternitatis without determinatively negating them. Browning should be lauded for his even-handedness. His text is a significant attempt to think both the history of political thought and various literary theoretical problems in textbook form. ‘Thought’, however, as Browning admits, ‘must avoid fixing limits on interpretive procedures’(17) and while perhaps useful as an introductory collection, this goes for Browning’s standpoint as well.